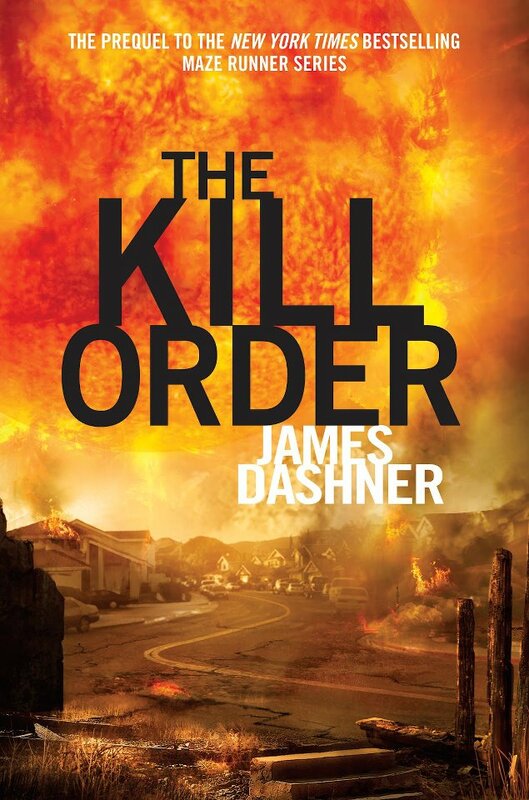 Review: “The Kill Order” (Maze Runner 0) | two men enter . . . The Kill Order is what I think of as a true prequel in that it is intended to be read after the original trilogy. If you are new to the series you need to start with The Maze Runner (which is also the strongest book of the series). If you don’t go that route, I think some elements in this book will be confusing and, more importantly, a number of crucial reveals from the trilogy will be given away. The bulk of The Kill Order takes place thirteen years before the events of The Maze Runner, mostly present-day narrative interspersed with recent flashbacks (usually through the dreams of its protagonist, Mark). It begins with a prologue that loosely ties it to the other books by showing Thomas (the original protagonist) and Teresa (his best friend) interacting just prior to having their memories wiped and being dropped into the maze. After this reminder of the prior books, The Kill Order jumps right in to its main setting, a post-apocalyptic North America ravaged by solar flares, and the central plot: survivors in an already devastated world who are now dealing with an emergent and rapidly-spreading pandemic (the “Flare” virus). For readers of the original trilogy, this is exciting stuff and a good premise to hook us: we’ll get to actually see the ruined world that spawned WICKED (the corporate group running unethical, to say the least, experiments to try to cure the virus in books 1-3). And we’ll get to learn more about how humanity initially reacted to the apocalyptic events that were the norm in the previous books. In this setting we are introduced to a group of survivors of the original solar flares: Mark (the young, male protagonist), Trina (his girlfriend), Alec and Lana (an older, ex-military couple largely responsible for the others even being alive), and other young secondary characters such as The Toad, Darnell, and Misty. Outside of a lightly-developed quasi-familial relationship between Mark and Alec, these characters largely lack the kind of depth or originality that creates reader interest or investment, something that seemed to work pretty well with the motley collection of kids in the original trilogy. The reason for this lack of depth is, in part, an over-reliance on action sequences and the breakneck pacing of the story. This leaves little time to do much with the characters, and Dashner falls back on one element that worked well in books 1-3 far too often here: action scenes. Compounding the problems of too-frequent, and lengthy, descriptions of fleeing or fistfights is the very nature of the virus itself: the infected are actually thinly-disguised zombies with a longer-than-usual viral gestation period. Purists will, of course, argue that the infected aren’t technically zombies because they are still alive and not resurrected, shambling moaners (or worse, that there’s no vodou/vodoun involved), but the basics are the same: the infected are increasingly irrational, hyper-violent toward non-infected (or less-infected who have yet to develop symptoms), and at times verge into cannibalism. Hairsplitting over the meaning of zombies aside, the story is primarily about a group of people trying to escape zombies, fighting zombies, occasionally losing one of there own to those zombies, and all the while trying to figure out how to keep themselves from becoming infected, stop all the zombies, and why this outbreak happened. Not that this isn’t entertaining in the way simple action-horror can be, but it gets old fast and can’t sustain a 320-page novel. Luckily, Dashner inserts a young girl (DeeDee) who is immune to infection, and she becomes the focus for Mark and the other characters. Initially, this is merely the humane thing to do: to save a child from increasingly crazy and violent people who believe her lack of symptoms makes her a demon (or at least in league with the “them” behind the Flare (and flares)). However, as the story moves toward its conclusion, Mark and his companions begin to realize they are also infected and that DeeDee is more important than just another child, they see her as a potential source for a cure for infection. A savior figure, if you will. This dovetails into the other books nicely as it explains part of how WICKED was started and implies that DeeDee is actually the Teresa of the original trilogy, which also adds to the obvious Christian overlay of the series. Despite this relatively successful plot surrounding DeeDee, the revelation of how the Flare virus spread is a bit disappointing. If one can’t figure it out from the book’s title, here it is: the provisional world government (the Post-Flares Commission based in relatively flare-free Alaska) deliberately released the virus to cull the population (operating under the belief that the virus would gradually lose effectiveness and die out). This is ostensibly done because the existing population is too large for available resources. This element, an old standard of right-wing conspiracy theorizing, doesn’t bother me in and of itself (and the overt delivery of it by troops with dart guns is forgivable too, I guess); however, the lack of exposition as to how this even seemed logical or smart is a deal-breaker for me. While I praised the prior three books for the lack of world exposition, and this book gives more than they do (and even goes so far as to implausibly reveal government memos and the like), The Kill Order doesn’t come through with the most important information–what the actual state of the world is–which renders the whole scenario a bit absurd. Dashner’s focus, insofar as the actual kill order is concerned, is the horror of discovering that a governmental group (read: western, formerly democratic, and probably mostly white male governmental group who under normal circumstances would never do such a thing /sarcasm) have committed what amounts to genocide (or class-based mass-murder, at least). While foregrounding the horror of such a decision is fair play, and a young man like Mark’s revulsion at learning about it is deserving of pathos, it isn’t enough: the skeptical reader isn’t given adequate information to believe that this decision has any logical justification. Like Mark, we can only see it as a manifestation of evil, which renders the whole thing less interesting from a world-building point-of-view. We get a very distinct, unnuanced view of binary good/evil rather than a more complicated question of cold, utilitarian calculus. If Dashner could construct a premise that, despite the large percentage of the population wiped out by the solar flares, and the survivor communities getting along okay, that there were serious resource shortages driving masses to starvation, it might work. But he doesn’t. For me, and I love rewriting flaws in stories, it would make more sense if the rationale for this viral genocide were explained in terms of dysgenics: that those in the flare zones were subject to dangerous mutations due to the radiation and should not be allowed to breed, thus must be wiped out. Still problematic and nasty, but more a believable premise and reasoning for these actions. This lack of plausibility is complicated most by the ending of the book, where Mark sends the virus-immune DeeDee through a molecular transporter to the very people who unleashed the virus with a note reading: “She’s immune to the Flare./Use her./Do it before the crazy people find you.” This sets her up as subject zero for WICKED in the original three books, and the premise is that the PFC and then WICKED come to realize the mistake made with the Flare virus later, which makes it work structurally. However, if the “they” on the other side of the transporter that he is delivering her to are the same ones who are actively trying to wipe out large chunks of humanity, Mark’s altruism toward them and decision-making in this moment are quite suspect. And maybe that’s the point. Mark is quite obviously infected with the Flare and becoming increasingly irrational and given to violence, but his care for DeeDee (and Trina) throughout the end of the book imply that he will still be able to reason through this decision more convincingly than I found this to be. On the ending (which I won’t totally give away): as with the prior books, Dashner does a good job of not caving to those who think books “for kids” should have a nicely wrapped-up and happy ending. This one is messy and people readers are supposed to care about die (if heroically). All in all, I did enjoy reading The Kill Order and would recommend it to those who like the other books. But it is definably less well-constructed as a world than those books, and it certainly overdoes the action sequences.